"May the SAKE force be with you!" This was something that took place around 200 years ago. Tokyo was then Edo, an overcrowded city consisting of more than one million people crammed into a 1.8 square kilometer area. A variety of strategies and sophistication were needed in order to handle the demands generated by this situation. With regards to the food service industry, two distinct types of establishment emerged. On the one hand, there were shops that one might visit on a regular basis for which quick service was sought, on the other hand special formal establishments existed to provide spaces for more leisured enjoyment. Incidentally, this concept of enjoying something in a relatively short time frame is clearly seen in a variety of specialized vocabulary for verbs related to eating and drinking. Soba noodles are "pulled up" / No word exists denoting a longer time frame. Sushi is "pinched" / No word exists denoting a longer time frame. Liquor is "emptied" / For a longer time frame, "drinks are exchanged." Tea is "taken" / For a long time frame, it is consumed ceremonially. One showers / For a long time frame, one soaks. The izakaya-style pub began to take shape in the middle of the Edo period. As described above, it had the following "fast food" characteristics. Drinks and snacks were served quickly. Generally customers did not stay for long periods. However, visiting everyday was acceptable. In modern day Tokyo, however, Japanese people's lifestyles have changed. To "go out for drinks" has come to mean going out for dinner. 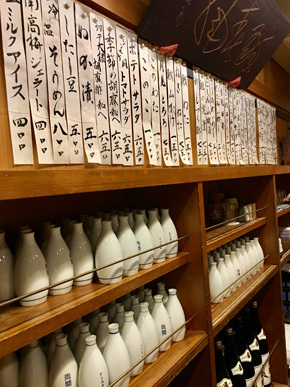 Therefore, many izakayas place a great deal of attention on the quality of their food, while sake sommeliers explain the brands and characteristics of Japanese rice wine in the same manner as wine. They have also become places where customers can casually enjoy themselves over an extended period. Despite the changing times, Shinsuke has remained one of the few "platonic taverns," which specialize in being a place where people stop on their way home from work to relax with a drink. However, traditional menu items have been updated to fit modern tastes while the "slow food," which customers have come to expect is served with the normal fast service. The resulting space is one which uniquely embodies the historical but does not feel outdated, a feat that has attracted attention both in Japan and abroad. The current proprietor of Shinsuke belongs to the eleventh generation of his family to manage the establishment. 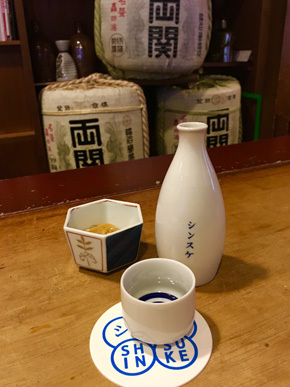 Until the seventh generation, Shinsuke was operated as a liquor store (where patrons drank standing up), but after the Great Kanto earthquake of 1923, it was reestablished as an izakaya.